Fergie MacDonald with the book about his father. 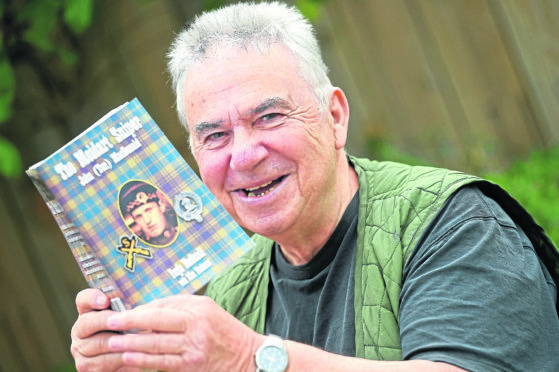 Legendary Highland musician Fergie MacDonald has written a personal account of his father’s experiences surviving some of bloodiest military confrontations in history. The book is to be released this week about John “Ton” MacDonald’s time serving in Gallipoli and the Somme as a member of the elite Lovat Scouts during the First World War. Ton enlisted in the Territorial Army in 1914 while underage with a number of friends from the Moidart area. The skills of many men who worked the land –such as deer stalkers – were put to lethal use in the war with Ton eventually becoming a Lovat Scout Sharpshooter. Musician and composer MacDonald, who hails from Moidart and is best known for his accomplished accordian playing, wrote the book based on Ton’s letters, as well as remembering the stories he was told growing up. He said: “They were mostly letters and things that he kept, his aunt kept. As far as Gallipoli goes, they were in a Suvla and they were there until the evacuation – there is lots of stories of what he was doing there. One story tells of how the Lovats were ordered to kill a lethal Turkish sniper nicknamed Percy by the troops. Corporal Angus Mackay located Percy in a hide in no man’s land and shot him dead but was wounded. On Percy’s dead body they found a number of British dog-tags round his neck – thought to be his number of kills. Ton remembered Mr MacKay being carried past in a stretcher saying in Gaelic “Fhuair mi e” meaning “I got him” with Percy’s rifle beside him. After Gallipoli the troops were evacuated to Egypt where Ton was demobilised in 1915 for time served and returned to Moidart. However, he was now off age and with a reputation as crack shot as battalion sniper he re-enlisted and was sent to the Lovat Scout Sharpshooters (LSS). Ton’s last action of the war came just days before the Armistice and led to the discovery of a hidden gun battery that was destroyed by artillery.